To large mixing bowl, add baking soda, citric acid, and lathanol powder. Break up any clumps with wire whisk. Drizzle fragrance over powders and blend in well. Add pink powder and blend until powder is all one color. 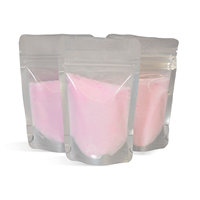 Using plastic funnel, fill each bag with 3 oz. of product. Seal closed with flat iron. Place a tiny pinhole in each bag to release any gases that will build up.This is a natural occurence when mixing the dry powders. To Use: Sprinkle desired amount of powder into bath under running water. Ingredient Label: Baking Soda, Citric Acid, Sodium Lauryl Sulfoacetate, Buttermilk, Fragrance, Red 28, Red 22. "One answer advises not to package this powder in a jar, while another answer says it's fine to put this in a jar. If packaged in a plastic jar or bottle with a screw-on cap, will unsafe gases build up? " Staff Answer The bath fizzy mixture should be fine if packaged in a plastic jar. You might need to test in a bottle as the mixture can harden and may be difficult to shake out of the bottle. "Is the fragance oil amount correct? In your calculator says that I can use the 5%"
Staff Answer We chose not to use the 5% fragrance as we thought it would be too strong. The fragrance calculator is a recommended amount. You can choose to use a lesser amount in your product. "How much fizzy powder in ounces will I make with this recipe?" Staff Answer You will make approximately 66 oz. of product. You will fill 22 bags with 3 oz. each but may have a little left over after they are filled. "In this recipe Can I use mica? If I use it will tint the water? I have read about using Poly 80, in this case what’s the use?" Staff Answer You can use micas in this recipe and we do recommend using poly 80. The amount should equal the amount of oil used in the recipe, whether fixed oil or fragrance. "Can jars be used instead of the bags to put the finished product in?" Staff Answer Yes, you can use plastic jars instead of bags to package this fizzy powder. "What can I substitute Buttermilk Powder with?" Staff Answer You can substitute another milk powder such as goat milk, coconut or yogurt. You could also add arrowroot powder. "I made this it got super hard? I put it in jars and added a scoop? Any suggestions on how to keep it from getting hard like a bomb? " Staff Answer You might try adding Aloe Vera Powder to the bath bomb mixture. It contains an anti-caking agent to prevent clumping and hardening. "If I wanted to add Poly 80 to this recipe, how much should I add? Thank you." 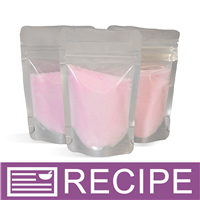 Staff Answer We do not recommend adding Poly 80 to this recipe since it will make the powder wet and may not package well as a dry bath fizzie powder. We recommend testing in a small batch if you would like to add it. 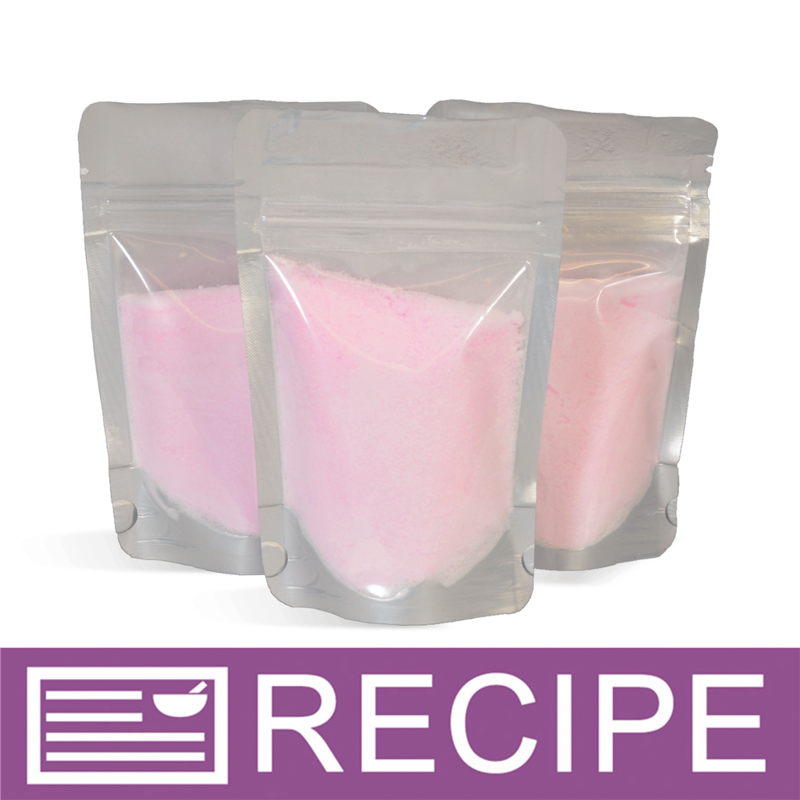 "I was actually making a similar recipe I made and using these 3oz bags. Both my recipe (-buttermilk power, +dendritic salt&sea salt,) and also tried this recipe. When I test in water, bubbles and fizzes fine but when I heatseal these bags with the mix, the bags expand with air, then when reopened, they don't fizz well. That seems to happen with any recipe with BS and CA I use, I've even tried adding silica packets but it doesn't help much. How cam this be fixed?" Staff Answer If the bags should expand, make a few pin holes in the top of the bag so the gas escapes. When we did this and used the powder later, it still fizzed as normal. "It says 2 ml of fragrance oil, is this correct? Seems like too low an amount." Staff Answer This amount is correct. We prefer to lightly scent our bath fizzies. You can choose to up the amount if you like to maybe 0.5-1%. "Is it safe to put this in glass bottle with a cork? I was concerned about any chemical reactions. I have heard of exploding glass bottles but not sure if this is true. Thank you!" Staff Answer We would not recommend this as gases can build up in the bottle from the ingredients in the recipe. "Since SLSa is such an airborne powder, does it incorporate fully in the mix, or will it fly around when the package is opened?" Staff Answer It should not fly around into the air once the package is opened. "Will the neon powder color the water? Would poly80 be needed if a different type of colorant (such as mica) or if more than 1% of fragrance oil is used?" Staff Answer The neon powders will tint the water. You will need to test if using another color or additional fragrance oil to see if you might need to add Poly 80. "I think I miss read this, I was expecting a bubble bath. Would you need to add more LAL to make it an actual bubble bath? If so how much? Thank you"
Staff Answer We are sorry you misread the recipe. We do say this is a powdered version of a bath fizzy. You would need to at least double the amount of Lathanol powder or you may want to follow one of our milk bath recipes: http://www.wholesalesuppliesplus.com/education/recipes/foaming-soy-milk-bath.aspx. "I believe these bags hold 3 ounces of dry ingredients, how many fizzy baths would you get out of it? I know it depends on personal preference but would it be 1 or more? Thank you"
Staff Answer You should be able to get between 2-3 baths out of one pouch. "I was wanting to make this but I have everything but the Buttermilk Powder. Can the buttermilk just be omitted and substituted with something else?" Staff Answer You can omit the buttermilk powder completely or substitute for another milk or yogurt powder.